Cameron Carter, Lil Wayne’s SonBorn on the 9th of September, 2009 in Los Angeles, California, Cameron Carter has got a good relationship with both his parents. Lil Wayne’s son Cameron Carter is now 8 and will be celebrating his 9th birthday in a couple of months. 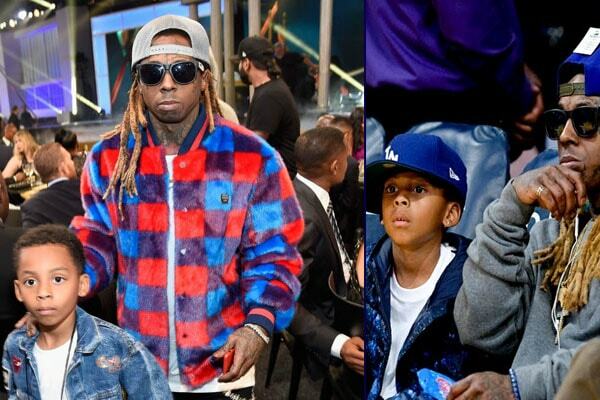 Once during a rare occasion, Lil Wayne’s son Cameron Carter was seen with him at the Lakers game. They were enjoying a lot during the game. From that, we can clearly see how strong bond the father-son duo has. Lil Wayne and his son Cameron Carter enjoying a Lakers game. Rapper Lil Wayne and his son Cameron Carter have a lookalike face. The resemblance is uncanny. Cameron looks like a mini version of Lil Wayne. Like her second son Kross Asghedom, Lauren also tends to keep her elder son Cameron away from the media limelight. She rarely posts photos of him. Even if she does, Lauren makes sure that the face is unrevealed. The same goes for Lil Wayne too. He tends to keep his children away from the spotlight. Lauren is like a mama bear protecting her cubs from any harm. The little Carter may be a single child, but he has got siblings too. As mentioned above Lil Wayne has got four children with four different women. So, Cameron has got three other half-siblings. Lil Wayne’s first daughter and son, Reginae Carter and Dwayne Michael Carter III are the elder half-siblings of Cameron. Lil Wayne’s son Cameron Carter has a younger half-brother named Neal Carter. Morrison Tartan Kilt | Length You Prefer - Design You Like!